Normal: normal length in actual timeframe. You can adjust the length in bars with the "Normal_TL_Period" setting. Ideal for any usage such as break without or with backtest, turn around, etc. Default style: Gray (Gainsboro) line with normal width. Long: higher timeframe's trendline which is longer than the Normal TL. Ideal usage for turn around (bounce) and target price. For simple breakout it need more filtering methods. Default style: Orange (Goldenrod) line with normal width. Three Touch: trendlines which touch the candles three or more times. Less filtering is enough because the 3 or more touches confirmating that the market sees them. Ideal for any usage. Default stlye: White line with thicker line. Narrow: In uncertain market situation there are many possible lines. TrueTL filters the „too close” trendlines and sort to this group. Ideal usage if you like to see every details about the market. Default style: No color (hidden). NEW! Triangle Mode: in this mode the indicator analyses the whole chart, then selects and draws only the two nearest trendlines: upper and lower. 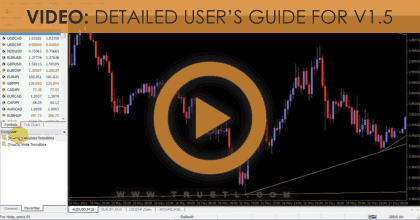 Basically TrueTL draws all possible trendlines to use for many things: entry, entry-filtering, R/R calculation, SL / TP price, etc. The "Triangle Mode" is ideal if you are looking for an entry only. It's worth to try it out with "Lazy Redraw" option. NEW! Three Touch In Triangle Mode: in "Triangle Mode" True Trendline Indicator draws additional trendlines which have three or more touches. 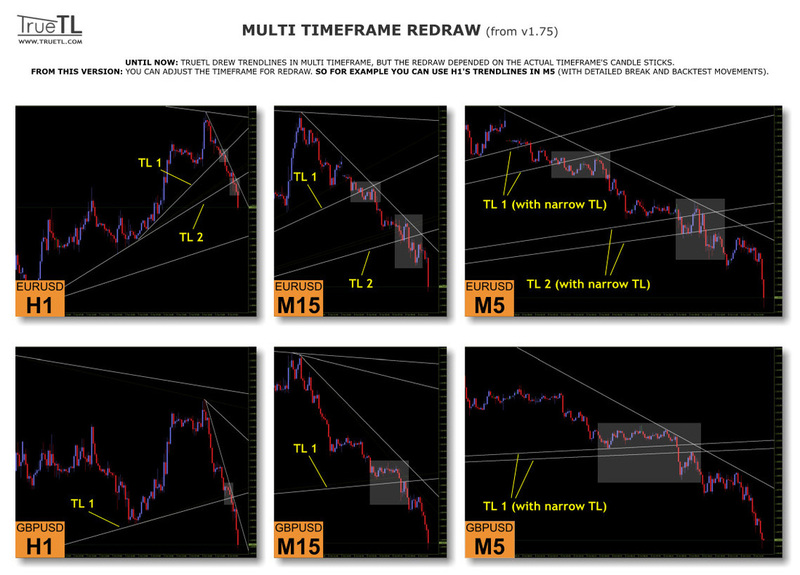 M1 Fast Analysis / M5 Fast Analysis: if you have a slower PC or you need only the closer chart movements in these timeframes, you can enable these option to faster operation. Mark Highest and Lowest TL: modify the thickness of the highest/lowest trendline ending. Alert for Normal TL: on/off the alert for Normal Trendlines. Alert for Long TL: on/off the alert for Long Trendlines. Alert for Three Touch TL: on/off the alert for Three Touch Trendlines. Alert for Narrow TL: on/off the alert for Narrow Trendlines.